Last week I mentioned that I had entered my Sweet Potato Cake (I added new/updated photos to the post) and Chocolate-Hazelnut Buckwheat Tart in a local baking contest. The next day I was so happy and excited to find out that my cake won first place and my chocolate tart won 3rd place! So today I’m glad to finally share another wining recipe with you. 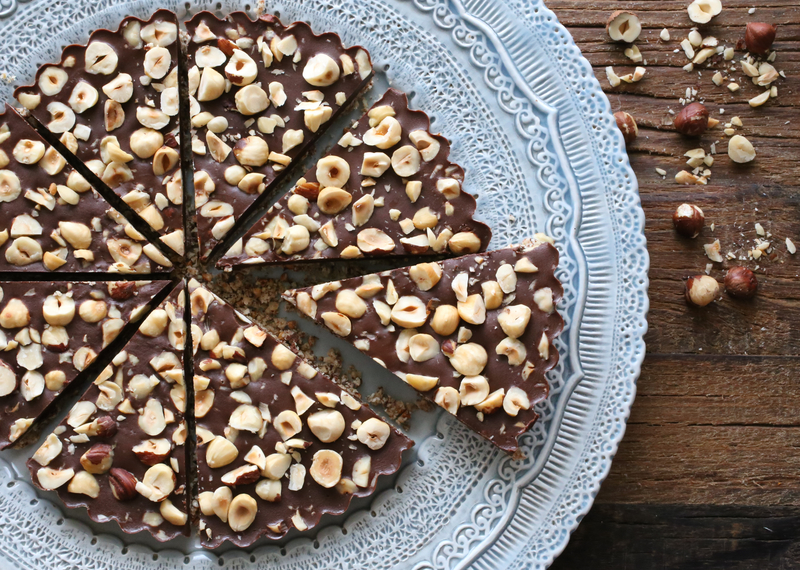 This simple and impressive tart is raw, vegan, gluten free and deliciously addictive! It’s so good! A friend introduced me to a version of this tart several weeks ago. I was having lunch at her house and for a light dessert she brought out small pieces of her chocolate tart. Delicious! I had never made or eaten a raw tart of this sort before so I was intrigued, and excited to try it myself. The crumbly crust is made from toasted buckwheat (kasha), ground nuts (hazelnuts and almonds), almond butter, and a hint of cocoa butter to help keep it all together. Eating it is really a heavenly experience. There’s a nice contrast between the quickly melting soft, dark chocolate and the crunchy crust and nut topping. You must try it! But I warn you though, the tart is addictive. You may find it a challenge to stop eating after just one slice! For inspiration, I’m nibbling on a piece right now as I sip my tea. To make the praline: In a skillet over medium heat, combine agave and nuts. Heat until the nuts are well coated and the agave is frothy, about five minutes. Remove from heat and spread mixture onto a sheet of parchment paper. Allow to cool and harden completely. When cool, pulse mixture a few times in a food processor until ground. Be careful not to pulse so long that it becomes a paste. This praline recipe will yield more than you need for the tart. You can store the excess in an air container, the the refrigerator. In a bowl, combine praline, ground hazelnuts, buckwheat, and almond butter. Set aside. Slowly melt cocoa butter. Pour into bowl with buckwheat mixture. Stir until combined. Transfer buckwheat mixture into an 8″ tart mold with a removable bottom. Using your hands and fingers, press the mixture evenly into the tart pan. Tip: Lightly oil your hands with a little coconut oil before handling the mixture as it will help the crumbly mixture not stick as much to your hands. Refrigerate at least an hour for crust to take shape/structure. In a saucepan over low heat, combine the dark chocolate and coconut butter. Stir until melted and combined. Pour melted chocolate over refrigerated and firm crust. Refrigerate for 1.5 to 2 hours. 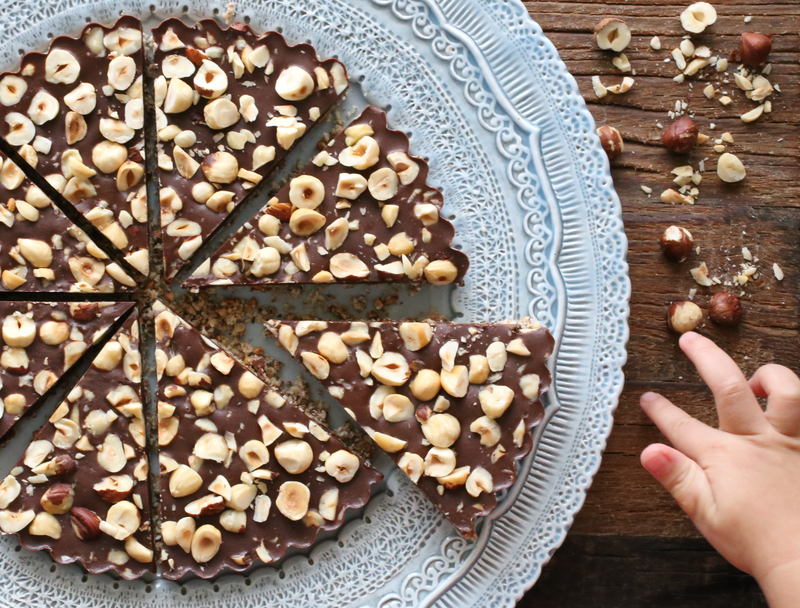 If using chopped hazelnuts for topping, remove tart from refrigerator about 20-30 minutes (chocolate should be soft enough for the hazelnuts to sink in slightly. The chocolate should be a little more firm, but not yet solid) after you put it in, scatter nuts and continue to refrigerate until chocolate is solid/completely firm. Notes: The hazelnut topping is optional. I’ve made this tart with and without it. To make the crust you have the choice of grinding your nuts and buckwheat finely, or you can chop the nuts in small chunks and use whole buckwheat kernels. I’ve made the crust both ways, it’s really a matter of preference. I think the tart is best when the chocolate is a bit soft so I’d recommend removing it from the refrigerator about 10 minutes before you plan to serve it. It melts relatively quickly so it’s not something you should leave out for hours (or even an hour) before you plan to eat it. This tart can be made in molds of different shapes and sizes. I chose an 8″ tart pan with a removable bottom as it is easy to remove the tart from such a pan. If you don’t have a tart pan with a removable bottom, use a hot, wet cloth on your mold to remove your tart from the pan with greater ease. Finally, the tart slices in the photos here are cut quite large. I did this just for the sake of the blog photos. To serve, I actually cut them in slivers of 1/2 or 1/3 of each slice in the photos. P.S. Recently, I also tried a raw pumpkin tart. I’m looking forward to sharing it with you as soon as possible! Thank you so much! I wish you very happy holidays too! Great! So happy you like both the hazelnuts and chocolate, a delicious combination those two! 🙂 A very merry Christmas to you and your family too! Thanks also for your kind words. Hazelnut! Wow, looks super delicious. Yes, hazelnuts! 🙂 Thank you, so glad you like the looks of this delicious tart! Thank you Dear Fae! Happy Holidays and much love to you and yours too! Merry Christmas and Happy New Year, dear Martine! Thank you sharing this delicious tart. Any thoughts how I can purchase a reasonably priced coconut butter? I found one at the market but it was terribly expensive ($35+). Can I substitute the coconut butter? Also, where do you find cocoa butter? And a very Merry Christmas to you to dearest Josephine! Wow, $35 for coconut butter?! It should cost no more than $14 for a 16 ounce jar!!!! Have you tried Loma Lind Market and/or Clarks? The brand I found is by Artisana ($13.99) another brand is by Nutiva and they call their coconut butter “Coconut Manna”. I believe theirs costs about $12. If you can’t find reasonably priced coconut there is an alternative! The original recipe called for coconut cream instead. You can either buy coconut cream in a can, or refrigerate a can of coconut milk overnight. In the morning, do not shake the can. You’ll notice the milk has separated. The thick stuff at the top is coconut cream. Use that to mix in your chocolate. As for the food grade cocoa butter, I first bought mine online through Amazon (http://www.amazon.com/Certified-Unrefined-Incredible-Organically-Dominican/dp/B00CIZ0DNO/ref=sr_1_1?ie=UTF8&qid=1419396554&sr=8-1&keywords=cocoa+butter). I bought a pound bag for about $16. Then I found another brand at my local Whole Foods. A pound is a lot. If you can find a smaller size you can get it because this recipe only requires a very small amount of cocoa butter. I would imagine Clarks might have it? I hope that helps! Reblogged this on Buckwheat for your health. Thanks so much!!! So happy you like it! Great post! Always love to find recipes featuring buckwheat! Do you mind if we add it to the recipes on our website (thebirkettmills.com)? We’ll of course credit your blog! Thank you! Glad you like this recipe. You’re welcome to add it to the recipes on your site. When you post the recipe, can you please provide the link back to my blog? Thank you.